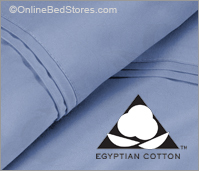 What do you look for if you want true 1,500 thread count Egyptian Cotton Sheets? Thread count refers to the number of horizontal and vertical threads per square inch of a piece of fabric. The more threads per square inch, the thicker or heavier the fabric. Thread count is important, but it does not necessarily guarantee a better sheet. A sheet that may feel good to one person may feel differently to another, it is a matter of preference. When shopping for 1500 thread count Egyptian cotton sheets, OBS recommends that you first decide what you would like the sheet to feel like, do you want a heavy thicker feel? or a thinner more pliable feel? Typically the higher thread count sheets are going to feel heavier or thicker and not as “drapey” or pliable, as a lower thread count thinner sheet. Also Keep in mind that when shopping for high thread count sheets “Ply” is very important to consider, Ply is the number of yarns used to create a single thread. Some sheet manufacturers actually twist yarns together and use a multi ply yarn to increase the number of threads enabling them to advertise a higher thread count, Look for sheets woven with single Ply yarns if you are seeking true 1500 thread count Egyptian cotton sheets.